FRAME "Le High" suede skirt. Button closure at left waist. Made in Italy of imported material. Andrew Gn skirt in stretch crepe, featuring grommet trim. Rise sits high on natural waist. A-line silhouette. Fringed hem. Mini length. Back zip. Viscose/acetate/tin alloy. Lining, viscose/polyester/spandex. Made in Italy. FRAME "Le High" denim skirt with whiskering & fading. High-rise; fold-over waistband. Four-pocket style. Straight silhouette. Mini length. Button/zip fly; belt loops. Cotton/polyester/spandex. Imported. Exclusively ours. Wash, Forest Falls. 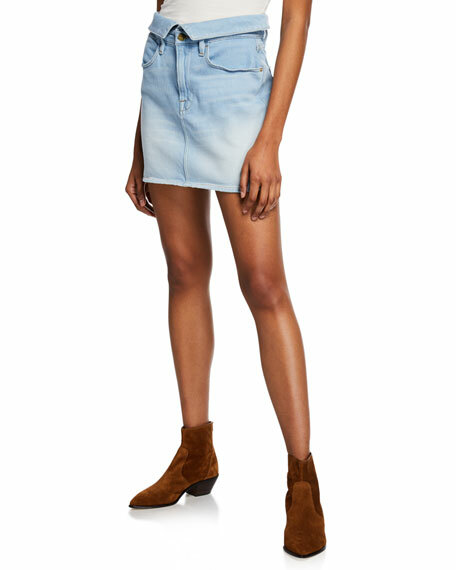 FRAME "Le Mini" skirt in denim. Approx. 14"L from waist to hem. Five-pocket style. Straight silhouette. Split, frayed hem. Button/zip fly; belt loops. Cotton/polyester/spandex. Machine wash. Made in USA of imported material. Exclusively ours. FRAME "Le Mini" denim skirt. Mid-rise; belt loops. Button-zip fly. Five-pocket style. Slim silhouette. Notched hem. Mini length. Cotton/polyester/spandex. Made in USA of imported materials.